Onopordum acanthium is a herb of the sunflower family (Asteraceae) that is native to Europe and Asia. It has been introduced to temperate climates elsewhere, including much of North America and Australia. 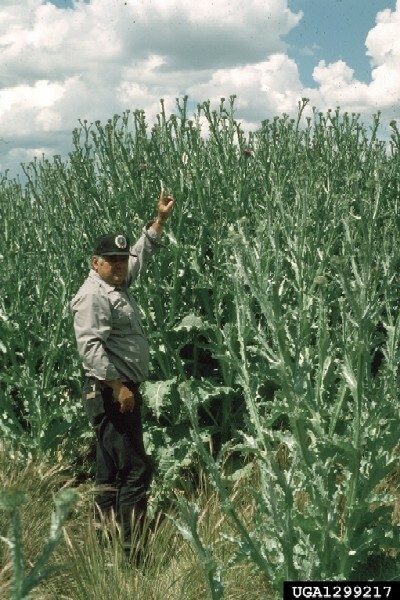 In North America, Onopordum acanthium is a weed problem on western rangeland and produces significant economic losses for ranchers. Seeds are dispersed locally by wind, humans, water, livestock, and wildlife are involved in long distance dispersal. WSWB (2003) describes O. acanthium as a branched, robust biennial (or sometimes annual) that often grows 2.5m or more in height and 2m in width. Main stems may be up to 10cm wide at the base. Stems have vertical rows of prominent, spiny, ribbon-like leaf material or \"wings\" that extend to the base of the flower heads. Leaves, which are armed with sharp, yellow spines, are up to 60cm long and 30cm wide. Upper and lower leaf surfaces are covered with a thick mat of cotton-like or woolly hairs, which give the foliage a gray-green appearance. The globe-shaped flower heads are borne in groups of 2 or 3 on branch tips. Flower heads are up to 5cm in diameter, with long, stiff, needle-like bracts at the base. Flowers range from dark pink to lavender. Seeds are smooth, slender, and plumed (Dewey 1991, Callihan and Miller 1998, in WSWB, 2003). The O. acanthium cypsela survival period in soils is extremely high. Seeds are sensitive to light and while some seeds will germinate in the dark, studies indicate that most germination occurs with alternating light/dark cycles, with 8 hours being the optimal day length (Young and Evans 1972).The cypselas (fruits) of O. acanthium display a considerable degree of variation, both morphological (cypsela weight) and physiological (germination percentage). Seeds from different mother plants show very variable levels of dormancy (Pérez-García., 1993). WSWB (2003) notes that O. acanthium is sometimes sold as an ornamental plant. It has reportedly been used to treat cancers and ulcers and to diminish discharges of mucous membranes. The receptacle was eaten in earlier times like an artichoke. The cottony hairs on the stem have been occasionally collected to stuff pillows. Oil from O. acanthium seeds has been used in Europe for burning and cooking. WSWB (2003) notes that in its native Europe, O. acanthium is well established in continental areas with summer-dry climates (Mucina 1989, in WSWB, 2003). In the western U.S., O. acanthium infests wet meadows and pastures, as well as more arid big sagebrush (Artemisia tridentata Nutt.) sites (Hooper et al. 1970, in WSWB, 2003). O. acanthium is often associated with waste places, as well as rivers, streams, canals, or other waterways. It can also be abundant in dry pastures, fields, and rangeland (Dewey 1991, in WSWB, 2003). In particular, the plant thrives in light, well drained, and sandy or stony soils (Piper 1984, in WSWB, 2003). Temperature and moisture, rather than soil nutrient concentrations determine the ecological performance of Onopordum species (Austin et al. 1985 in Sindel 1991, in WSWB, 2003). Individual plants produce 8,400 to 40,000 seeds (Young and Evans 1969, in Sindel 1991, in WSWB, 2003). Seeds are dispersed locally by wind; humans, water, livestock, and wildlife are involved in long distance dispersal (Piper 1984, in WSWB, 2003). Plants flower in mid-summer (WSWB, 2003). Soil nutrient concentrations are less important to Onopordum spp. establishment than temperature and moisture (Austin et al. 1985 in Sindel 1991, in WSWB, 2003). 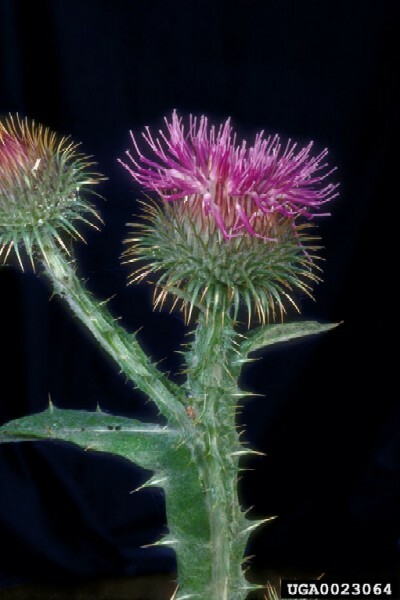 WSWB (2003) notes that Scotch thistle is sometimes sold as an ornamental plant. Recommended citation: Global Invasive Species Database (2019) Species profile: Onopordum acanthium. Downloaded from http://www.iucngisd.org/gisd/species.php?sc=295 on 22-04-2019. Infestations of Onopordum acanthium reduce forage production and virtually prohibit land utilization for livestock. Dense stands of the large, spiny plants constitute a barrier to livestock movement, almost totally excluding animals from grazing and access to water (Hooper et al. 1970, Sindel 1991, in WSWB, 2003). Additionally, O. acanthium can spread rapidly.According to WSWB (2003). Physical: Small areas can be eradicated by digging. Plants must be cut off below the soil, leaving no leaves attached (Julian and Rife UNDATED, in WSWB, 2003). Mowing has limited effectiveness for controlling O. acanthium. It usually only prevents seed production if done either immediately prior to flowering or when plants are just starting to flower. When mowing is conducted too early, it may only delay flowering. However, when plants are cut too late in the flowering process, viable seed may still develop in the capitula following cutting. Because there can be a wide variety in the maturity of plants, a single mowing is unlikely to provide satisfactory control (Sindel 1991, in WSWB, 2003). O. acanthium invasions may be prevented by manipulating the cropping environment (cultural control methods). For example, establishing and maintaining dense, vigorous, competitive pasture can effectively prevent O. acanthium establishment. Healthy pasture is particularly important in the autumn, when most O. acanthium seeds germinate. \r\nChemical: For herbicide control, Picloram, dicamba, 2,4-D, dicamba + 2,4,-D, and metsulfuron are effective for controlling O. acanthium (Beck 1991, Cargill et al. 1998, in WSWB, 2003). Application rates vary depending on stand density and environmental conditions. Herbicides should be applied in the spring before O. acanthium bolts, or in the fall to rosettes (Beck 1991, in WSWB, 2003). \r\nBiological: Thistle invasion in unlikely to occur in ungrazed pasture. Goats will graze O. acanthium, reducing plant numbers and preventing seed production (Sindel 1991, in WSWB, 2003). No biological controls are currently available in the United States. Australia has released several biocontrol insects. Four control agents have been used in the biocontrol of O. acanthium a seed-feeding weevil Larinus latus was first released on 200 sites during 1993. It was found that the agents had eaten through 83% of the seed on released sites. A second control agent Lixus cardui, slower to spread than the first one was released a year later, this affected the growth of the plant. There are plans to release four more agents; thistle rosette destroying weevil Trichosirocalus sp and moth Eublemma amoena , and two fliesBotanophila spinosa and Urophora terebrans which attack rosettes and seed respectivley (CRC Weeds Dispatch, winter 2001). These control agents however, have failed host specificity tests in the U.S. Additional insects are being evaluated for release in the U.S. (Joley et al. 1998, in WSWB, 2003). Informations on Onopordum acanthium has been recorded for the following locations. Click on the name for additional informations. Briese, D., A. Swirepik, and T. Woodburn. 2001. Other Thistles in Trouble. CRC Weeds Despatch. Co-operative Research Centre for Weed Management Systems. Summary: An article describing biocontrol agents of O. acanthium in Australia. Available from: http://www.ento.csiro.au/research/weedmgmt/Weeds%20Despatch/despatchfive.html [Accessed 26 August 2003]. WSWB (Washington State Weed Board). 2003. Scotch thistle (Onopordum acanthium). Washington State Noxious Weed Control Board. Summary: A fact sheet that provides an overview of O. acanthium. 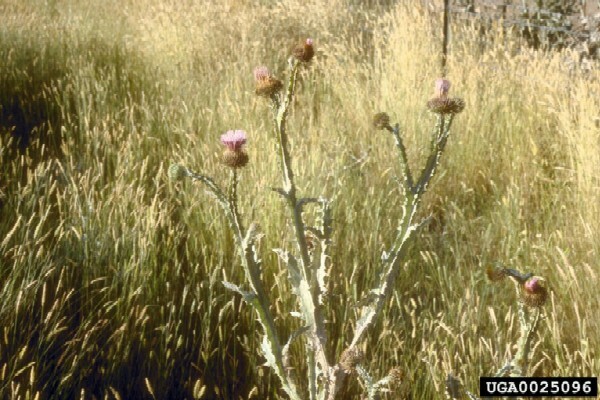 Available from: http://www.nwcb.wa.gov/weed_info/scotchthistle.html [Accessed 26 August 2003]. Summary: An information network that provides geographic distribution information on O. acanthium. USDA-NRCS (United States Department of Agriculture). 2002. Onopordum acanthium. The Plants Database. Natural Resource Conservation Service. Available from: http://plants.usda.gov/cgi_bin/plant_profile.cgi?symbol=ONAC [Accessed 18 August 2003].